ArecaBay Force Field is a zero-impact software-only product. It comprises of a collection of intelligent, light-weight, and easy to deploy MicroSensors that are sprinkled across your enterprise application stack. The MicroSensors in conjunction with a Local Intelligence Center called, LocalBay, will discover, monitor, and secure the enterprise application stack from advanced API payload threats even in a fast-paced CI/CD environment. ArecaBay Force Field supports multitude of application stacks running in private data centers, hybrid clouds, and public clouds including the serverless services. ArecaBay’s Network Engine consists of a collection of MicroSensors. The MicroSensor is comprised of an intelligent and extremely light-weight API Spec Engine that is capable of identifying and dissecting API payload to the object-level. This API Spec Engine is packaged into custom built software to run in Physical, Virtualized, Containerized, and Serverless environments. For other existing 3rd party products and infrastructure, this API Spec Engine is packaged as plugins and integration packages. The Network Engine works in a continuous loop with a self-adaptive API spec generation module that consumes unknown data to accurately identify to a microscopic level the API and the objects within its payload. This API spec is fed back into the network engine to accurately identify and extract only the relevant APIs and their object-level payload. 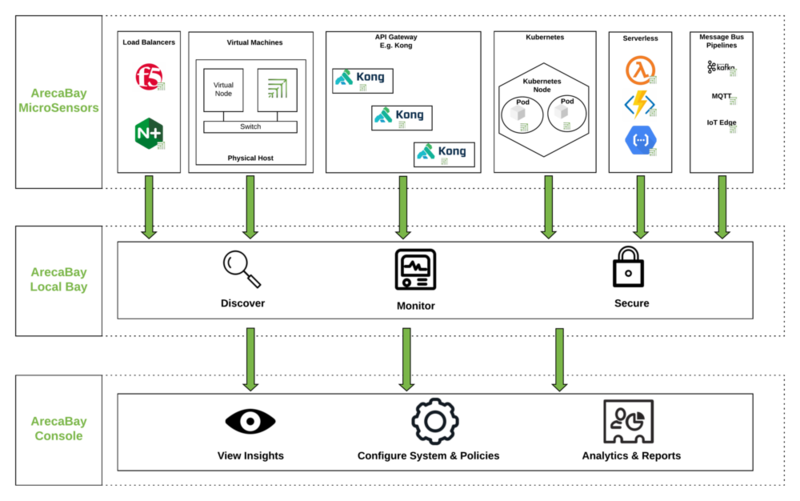 This combined with correlation across various call segments allows ArecaBay to accurately provide rich contextual insights into the API transactions leading to various discover, monitor, and secure use-cases. The ArecaBay Console allows for configuration of the system & policies, view insights, and also to generate analytics & reports for use by DevOp, DevSecOp, and also InfoSec teams. Non-intrusive and light weight software components are purpose built to access real-time API data without any modifications to the application or a run time. Deployment models support a wide range of hybrid clouds approaches and infrastructures, including micro-services, virtual machines, serverless and more. A self-adaptive API learning based on patent-pending Multi-Stage Machine Learning to accurately identify the API constructs as well as model the user or service behavior around APIs and call flows over a multitude of enterprise applications leading to high fidelity detection of zero-day threats and anomalies. DART provides an API data security posture dashboard for DevSecOps and the CISO to continuously monitor enterprise apps across clouds with zero-impact to apps, especially in environments with frequent app updates in a CI/CD environment. DART’s anomaly detection enables API DLP to take policy action against highly targeted data fields and transactions. Contextual and behavioral analysis enabled by deep understanding of API constructs allow for access control policy enforcement in real-time actively preventing API level threats. Built to the modern world of distributed applications ArecaBay supports millions of sensors in a single deployment. All solutions are 100% software-based, providing fast time to value and easy upgrades.